The Bakers Arms in Alton High Street has closed again because the leaseholder ceased trading on 25 February 2019 - the future is uncertain. On 13th February the EHDC Planning Committee almost unanimously threw out the application to redevelop the Queen's Hotel for housing. Councillors pretty well eviscerated the Officer's report and and asserted the primacy of Local and National Park Plan policies, particularly with regard to local amenity and tourist accommodation, and gave very short shrift to the idea that what the owner had paid and should expect as a return was any sort of material consideration. The "marketing exercise" came in for a lot of scorn as well. The George, Alton intends to reinstate the "loyalty card" sometime in the future, which will give you a free pint after you have bought a certain number of pints (number to be decided) - BUT it will be restricted to 1 stamp per person per purchase - so users will be prevented from getting (say) 6 stamps if they buy 6 beers (for friends, say) at any one time. 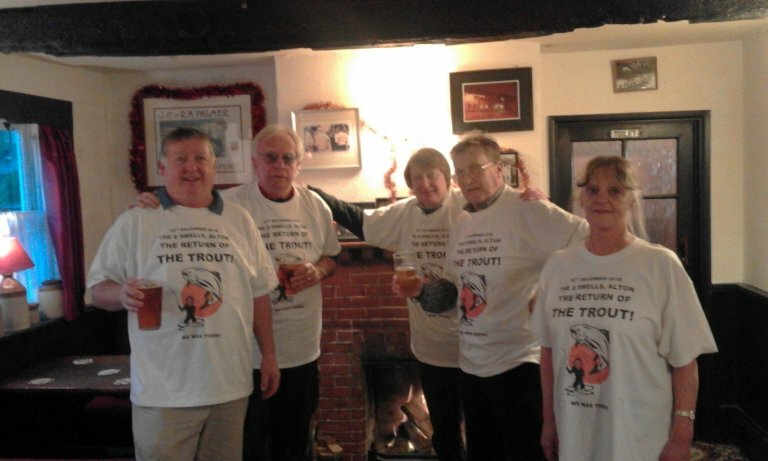 Branch member Tony Davis was at the Eight Bells for the last day of Nigel's tenancy on Sunday 16th December and first day of owner Phil 'The Trout' Troubridge taking back the reins on Monday. A good crowd was there on both occasions. The picture shows the two Jeremies with Phil, staff member Julia and Tony Davis, East Hants CAMRA Pubs officer. Congratulations to all of them from the CAMRA East Hampshire committee. The Market Hotel, Alton re-opened on 30 August with new manager Andy Fairburn and partner Jackie in charge. Very much a work in progress at the moment with one real ale, Sharp's Doom Bar, decently served but at least up to three are promised plus a full food service within a month or so. Accommodation will be available. The range of pub games promised will include darts, dominoes and crib as well as darts and pool. The venue is dog and child friendly and East Hampshire CAMRA branch wish it well for the future. The Triple fff brewery is now able to open their shop (Offf the Rails) for drinking on the premises. The George, Alton has reinstated the discount to CAMRA members - you now can get 20p/pint discount. The Star Inn at Bentworth is in danger of being re-developed. The pub was voluntarily closed by the owner after many years of neglect and under-investment, and has declined offers from purchasers seeking to keep it as a pub, and now wishes to redevelop it for residential purposes. Yes, after 25 years we have decided, for a variety of reasons, to discontinue the annual beer festival. The Flower Pots will still be open (standard hours) for plenty of great beer.